There was drama in parliament this morning after Â Independent Electoral and Boundaries Commission commissioners walked out of the a houseÂ committee briefly protesting a decision to have them take oaths before presenting election results. 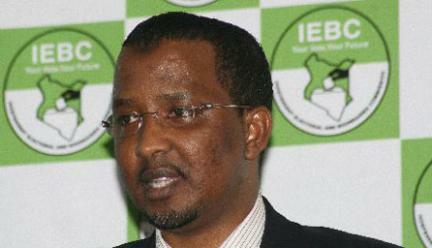 The commissioners were divided on the matter, IEBC Chairman refused to take an oath and instead accused the Justice and Legal Affairs committee of Mischief alleging that no other commission had been required to take such oath before presenting such documents. Immediately Isaack Hassan refused to take oath, commissioners walked out and briefly consulted before presenting final results of the rigged March 4th election. The house committee which has powers and privileges as a full session of parliament was adjourned by its chairman Samuel Chepkonga until Tuesday to interrogate the poll results and further ruled that IEBC Commissioners will have to take oaths. Later it was alleged that Isaack Hassan a Muslim by religion could not take an oath on documents whose truth he cannot ascertain; hence fear for the unknown considering it is the holy month of Ramadhan. Dagorreti North MP Simba Arati has claimed in the past days that the commission is divided especially as regards the release of the election results. It has been alleged that in the March 4th election more than one million ghost votes were casted in favour of a certain presidential candidate and failed to vote for the other five seats cementing speculation that Uhuru Kenyatta may have won the election through fraud. A presidential petition filed by hot favourite Raila Odinga was heard and determined in the absence of crucial evidence that the Supreme Court had rejected its inclusion as it was ruled time barred.